Efficiency located at the Sun N Sand Resort! This efficiency is located on the 6th floor at the Sun N Sand Resort! This unit sleeps 2 in the king bed. 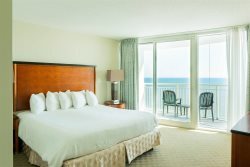 It's the perfect spot for couples and what better way than to wake up to a view of the ocean with your own private balcony! The unit has a mini fridge and microwave. Please Note: The HOA is in the middle of several renovations. We do not have an exact calendar of when this will be finished. Currently, they are painting the exterior of the building and the balconies through the end of November and the balcony may not be accessible if you book during this time. The hot tub, bar and restaurant are also undergoing maintenance. This is out of our control and we apologize for any inconvenience.